At UpScale Music, it’s about YOU and your MUSIC and us helping you with the technology. We are musicians, technicians, and engineers who understand the “arts and sciences” of the recording and music businesses. We offer multiple services including audio recording system design, equipment sales, custom cable manufacturing, electronic repair, and consultation. Your satisfaction is UpScale Music’s primary objective. We are available via email, telephone, or in person to listen to you, understand your needs, and help you achieve your vision. We have been recording music since the 1960s. Our passion for recording grew out of our desire to write, play, and record original music - on our terms. We know it’s hard to get clear guidance on what equipment you need and how it functions so that you can work on your terms. We’ve been there. Like you, we are musicians first and regard the equipment as an extension of the creative process – essentially like another instrument to master. Once we understand your musical vision, we can help you select the right system and show you how to use it, thus freeing you to be creative and concentrate on your art. As your requirements evolve we’ll be there to guide you and assist you. We’re interested in helping you sound amazing. We'll discover ways for you to sound better than even you imagined. We design and install systems for professional and personal project studios – from simple patch bays and wiring harnesses to complete system design and installation, including room acoustical treatment. When you buy a system from us, we guarantee that it will work the way it's supposed to. And we’ll help you understand how to use it. If you already have recording gear, we can help you tweak it for maximum performance. 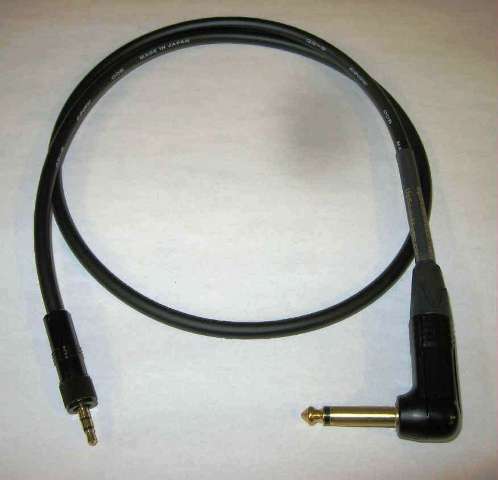 Superior, harmonically transparent, guitar, microphone and patch cables – quickly built to order. UpScale Music hand-manufactures each high quality cable to meet your specifications, using Canare or Mogami cable and Neutrik connectors - the finest components in the world. We have supplied numerous professional and semi-professional musicians around the world, with cables they claim are the best they’ve ever used. For these customers, when it comes to sound quality, “hearing is believing”. We think you’ll hear the difference too. We provide Professional Audio repair and maintenance with over two decades of industry experience. We repair all types of modern and vintage professional audio equipment – amps, mixers, outboard effects processors, classic multi-track tape machines, and vintage analog consoles. We're an authorized service center for many UpScale Brands including; Genz Benz, Marshall, VOX, Roland, Korg and Audioaccess. Connecticut State Certified Electronic Technicians - License # TVR.0702731-R1. After his Boston years Mario worked for Kaman Music as their Senior Technician / Technical Support person for Trace Elliot and Dean Markley. To gain a greater understanding of the high-end consumer audio market, Mario worked for Madrigal Audio Labs (home of Mark Levinson, Audioaccess multi-room systems) as a senior level repair technician and customer support specialist. Prior to starting UpScale Music, Mario served as the National Service Manager for Sennheiser and Neumann where he developed a comprehensive understanding of microphone applications for the recording studio, touring, broadcast and installed sound markets. While at Sennheiser he also led the technical support teams for Innova Son digital consoles, Turbo-Sound speakers, HHB recorders and Chevin amplification. Mario has 20 years of industry experience in technical support, management, manufacturing and business administration. He has worked with many major touring acts including Fleetwood Mac, Dave Matthews, Doobie Brothers, Bob Dylan, Rush, Bob Weir (Rat Dog), Phish, Bela Fleck, Pino Palladino, Tony Levin, Mark Karan, Crosby, Stills & Nash, Alan Holdsworth - and he’s always delivered satisfaction. An avid guitarist, Mario plays most nights - and records with his friends at UpScale Music, ensuring the equipment lines that we represent are the best for the recording musician. Mario is also a past president of the Newington Amateur Radio League in Newington, Connecticut. KB1DMT. Carlo P. Marchi – Carlo studied music composition and music education at Hiram College, Hiram, Ohio where he earned a Bachelor of Arts degree in Music Education. A constant urge to write and record music led him to the ever ongoing study of recording technology. While at Hiram College, Carlo and a fellow student designed and installed the first electronic music lab at the school’s Frohring Music Center in the mid 1970s. After graduating, he gigged in Connecticut area bands for a few years before settling into family life. Being the type of guy who needs to always further understand “how it works” Carlo then attended the University of Hartford’s Ward School of Electronics (Alpha-Chi honor Society member) where he received his degree in Electronic Engineering Technology. After graduating, he owned and operated a project studio. Computer technology, MIDI and digital recording developments were incorporated as they became available. His engineering interest also evolved into design, construction and modification of custom studio gear. Carlo has 12 years of professional experience in management, design, development, and installation of electronic control systems and 20 years as a technical sales and support specialist.